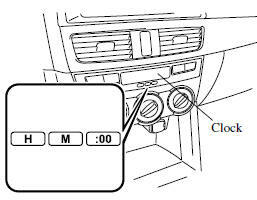 The time is displayed when the ignition is switched to ACC or ON. 1. Switch the ignition ACC or ON. The hours advance while the time setting button ( ) is pressed. 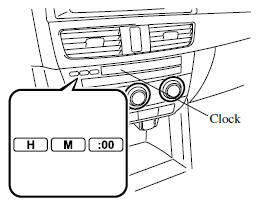 The minutes advance while the time setting button ( ) is pressed. 1. Switch the ignition to ACC or ON. 2. Press the :00 button. When the :00 button is pressed, the seconds will start at “00”.